Hypotensive activity of the ethanolic and aqueous extracts of Moringa oleifera whole pods and their parts, namely, coat, pulp, and seed was investigated. The activity of the ethanolic extract of both the pods and the seeds was equivalent at the dose of 30 mg/kg. The ethyl acetate phase of the ethanolic extract of pods was found to be the most potent fraction at the same dose. 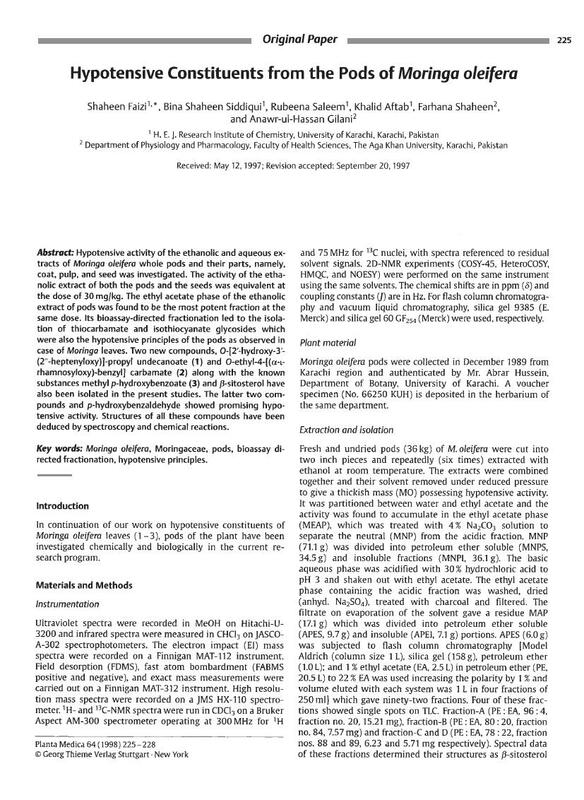 Its bioassay-directed fractionation led to the isolation of thiocarbamate and isothiocyanate glycosides which were also the hypotensive principles of the pods as observed in case of Moringa leaves. Two new compounds, O-[2′-hydroxy-3′-(2″heptenyloxy)]-propyl undecanoate (1) and O-ethyl-4-[(α-L-rhamnosyloxy)-benzyl] carbamate (2) along with the known substances methyl p-hydroxybenzoate (3) and β-sitosterol have also been isolated in the present studies. The latter two compounds and p-hydroxybenzaldehyde showed promising hypotensive activity. Structures of all these compounds have been deduced by spectroscopy and chemical reactions.